North Carolina Asian Americans Together (NCAAT) stands firmly with our immigrant and refugee families, friends and neighbors. As part of a community that has historically faced discrimination and detention on the basis of our heritage, NCAAT denounces the Trump administration’s executive action that unfairly and predominantly targets the Muslim community. Like the Chinese Exclusion Act of 1882 and the Asian Exclusion Act in 1924, Trump’s executive order — titled “Protecting the Nation From Foreign Terrorist Entry Into the United States” — is rooted in and fans xenophobic attitudes toward immigrants and results in the separation of families and unlawful imprisonment of immigrants and refugees. Trump’s executive order poses particular concern to North Carolina’s Asian American families. The Asian American population in the state is one of the fastest growing in the nation, and this growth is driven primarily by immigration. Between 2000 and 2014, over half — 56 percent — of the growth of the Asian American community in the state was from newcomers born abroad. Contrary to the ideals of this nation inscribed on the Statue of Liberty, this action not only slams the door in the face of the tired, the poor, the huddled masses yearning to breathe free, but also uproots legal permanent residents, refugees and other immigrants from the homes they have made and fought for on U.S. soil. Only together, learning from the mistakes of our past, can we move forward to build and maintain a stronger, safer and more welcoming state and nation. 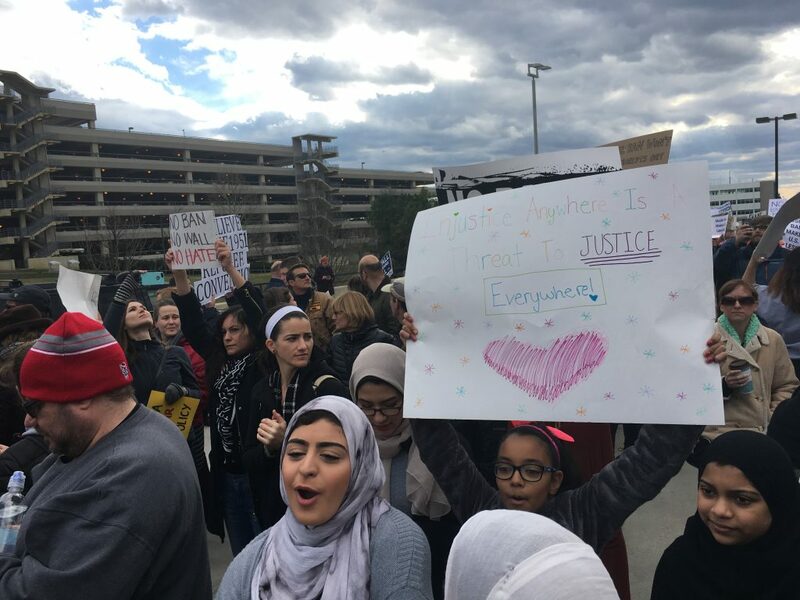 North Carolina residents protest Trump’s executive order at the Raleigh-Durham International Airport on Sunday, January 29, 2017, in solidarity with other demonstrations across the nation. Photo by Ricky Leung.